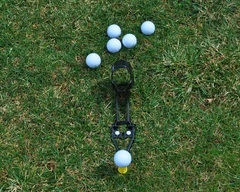 ​​​Introducing the DrivePoint XR Teeing System! ﻿DrivePoint XR is a patented golf training aid used by golfers to enjoy the advantages of an automatic golf tee virtually anywhere. Simply use your driver to load the ball onto the tee. Focus on your swing without the distraction of manually teeing balls. DrivePoint XR can be installed on natural turf or on a mat, used with a variety of different tees, and benefits golfers of any skill level. DrivePoint XR integrates to existing equipment ranging from a small, portable mat to a full hitting bay. Proudly made in the USA from durable materials DrivePoint XR is simple, versatile and compact. ﻿﻿​﻿﻿What are golfers saying about DrivePoint XR?